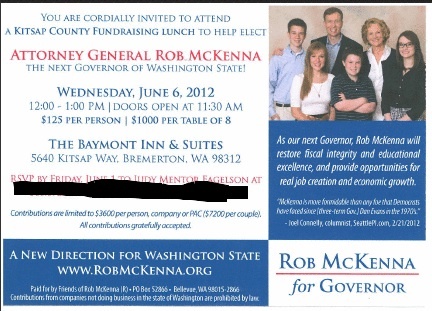 While attending the Rob McKenna fundraiser in Bremerton Thursday one of my first thoughts was of math. There were a few empty seats in the back, but the $125 donation was a minimum. If everyone gave the maximum, $3,600, the total would be $835,200. The total is probably somewhere in between there and very likely closer to the first dollar figure. We’ll know a little more when the PDC reports come out next week itemizing donations from this week. According to Thursday Public Disclosure Commission figures McKenna has raised $4,965,674.37, compared to Democratic contender Jay Inslee’s $5,365,475.95. Inslee also stands to benefit from the $2.8 million that will be spent campaigning on his behalf by the union-backed PAC Our Washington. There is no reason to suspect, however, that McKenna will not benefit from outside spending as well. The National Institute on Money in State Politics reports that in the five years between 2005 and 2010 what independent groups spent targeting Washington candidates was about 45.3 percent compared to the money candidates raised themselves. In 2010, when we didn’t have a governor race, the biggest independent spender in governors’ races across the country was the Republican Governors Association, about $26.5 million in just six races. In Wisconsin’s recall election of Gov. Scott Walker, the local PAC for RGA spent $9.4 million on Walker’s behalf, according to the Wisconsin Democracy Campaign. About $5.7 million of that was in negative advertising against two Democrats who filed to run against Walker. In the end the RGA money spent on positive ads for Walker was about the same as the organization’s negative ads against the Democrats’ eventual nominee, Tom Barrett, about $3.7 million each. Those figures are outside the $30.5 million Walker raised himself for the recall, compared to Barrett’s $3.9 million. Inslee already has more than Barrett did, but assuming this race gets attention nationally, we are only seeing the beginning of how much money will be spent in Washington on the governor’s race. No poll is showing a runaway win for either candidate, so it’s easy to believe that more big money will be flowing into this state. Read where Inslee used this guy to increase his chances . But anywhere else this guy would be bring with him negativity of being linked with him . In the far left he is seen as a heroe who was maligned by the right . Your right Steve , I think the Republican powers to be smell a candidate with a chance to win in a very dominated democratic party state . Inslee is a weak candidate , when ever their have been other choices he has lost badly with other democrats . Unions do see him as ultra friendly , a real friend . I expect a real nasty campaign who will see this as a Wisconsin . I just hope the citizens rise above it . Who knows , it may be ? I’m voting for Jay Inslee, but I will give Rob M. one thing. He is no friend of Jim Olsen’s and does not support him. Can’t say as I blame him.